This Outback Exploration tour has been designed for adventure travellers and backpackers wanting to get in touch with the real soul of the Australian outback. Over 9 glorious days you will get up close and personal with nature, wildlife, outback characters get off the beaten track to explore and experience real life in the outback with this hands on adventure of a lifetime. Departures are available from both Brisbane and Sydney so you don’t have to backtrack and can experience more of the outback. 07:00 - Check in at Brisbane Transit Centre Greyhound Coach Terminal. 07:30 Depart Brisbane on a Greyhound coach from the Greyhound terminal Brisbane Transit Centre bound for Toowoomba. 10:30 – Board Coach Qld service to Cunnamulla departing Toowoomba at 10:30 and arriving Cunnamulla 19:45. On arrival in Cunnamulla you will be collected given dinner and settled into your accommodation. Travel to Yowah the only place in the world you can find a type of opal called a Yowah Nut. Tour Yowah with a local including the Bluff lovers leap. Fossick for your very own Yowah Nut a special type of opal encased in an ironstone. Depart for the heritage town of Eulo, browse local galleries, enjoy a couple of beers at the Eulo Queen Hotel and discover the iconic Isabella Robinson the “Eulo Queen”. Travel back 100 million years in time in the Artesian Time Tunnel and learn all about the Artesian Basin and how it opened up this area to settlers. Browse through the museum and don’t forget the regional gallery, which hosts stunning works of art. Tonight immerse yourself with larger-than-life characters and enjoy a beer and yarn with the locals and some traditional Aussie tucker at the Cunnamulla Bowling Club. After a big night with the locals you get to have a sleep in. Wake naturally to the singing Australian native birds and help yourself to a continental breakfast or wander to Out the Back Australia headquarters for a cooked breakfast. Once everyone is on the move we will head for the magnificent Warrego River to embark on a kayak journey along the windy banks lined with a canopy of ancient river gums, wildlife and birdlife. Lunch will be at a secluded spot along the way under a shady Coolabah tree that the late Banjo Patterson made famous in his poetry. Bicycles are available if you fancy going for a ride. For those that rested you could now be at an advantage as we head for the adrenalin rush of sand boarding and sledding down the massive natural sand dunes. Tonight’s dinner will be a grand feed of roasted lamb and veggies while you sit back with a cool drink and soak in the peaceful ambience. Sit around the campfire and take the unique opportunity to master the ancient Aboriginal art of playing the didgeridoo, watch the star filled skies or have a sing along. The morning commences with an early breakfast as we depart for the adventures at Rocky Station. Another opportunity to stroll along the banks of the Warrego River on the “Wallaby Walk” so keep your eyes open and be quiet so you can spot one of these cute little fellas often seen at the water’s edge. Act out your “Indiana Jones” fantasy and navigate your way across the 70m swinging footbridge, never before open to the public. Arriving at the homestead, have morning tea and relish in the friendly country hospitality offered by station owners Chris and Mike Webster. After leaving Rocky Station we head for a farm where we will explore for a couple of days and camp under the star lit skies. There will be many photo opportunities as you look at the spectacular sunset, wildlife, farm animals and Australian native birds. Imagine laying back under a rich blue sky soaking up all the therapeutic goodness of the warm Artesian waters in natures very own spa bath, kangaroos, emu’s, sheep and cattle all wander freely and you are surrounded by nature for as far as you can see. It really doesn’t get much better than this! Tonight you will be served great bush tucker in a magnificent outback setting. 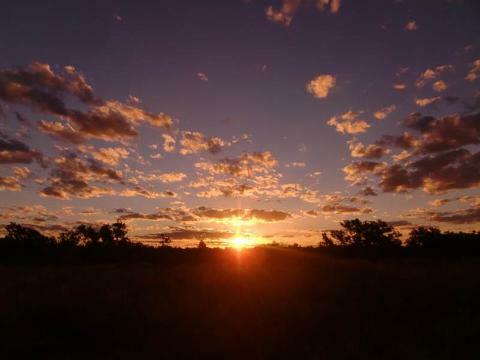 You will enjoy the evening sitting around the campfire sharing a yarn about your day’s experiences and enjoying some great bush entertainment as you immerse yourself in the outback culture. all in its natural environment. You will learn to make “Billy Tea” and “Damper” from a true blue Aussie. Enjoy the wide open spaces, clean green air and the great hospitality on a property in Queensland’s outback. Today feel a part of history unfolding as you explore the historic cemetery and uncover tales of characters and Cunnamulla legends. Have your final afternoon enjoying the characters as you complete an Aussie pub crawl at all the local’s watering holes. Connect to Greyhound Coach service departing Toowoomba 18:00 and arrive at Brisbane Transit Centre 19:40. GX951 - 07:30 - Wednesday departs Brisbane on a Greyhound Coach from the Greyhound terminal Brisbane Transit Centre arriving Toowoomba Bus Interchange Greyhound Coach terminal 09:40. BQ113 - 10:30 - Wednesday depart Toowoomba on Coach Qld service to St George arriving 16:00. BQ117 – 16:30 – Wednesday depart on Coach Qld service St George to Cunnamulla arriving 19:45. GX155 -18:00 - Thursday depart on Greyhound Coach service Toowoomba Bus Interchange and arrive at Brisbane Transit Centre 19:35. Daily collection to and from camp site is included as well as pick up and drop off on your arrival and departure. All entries are included as per itinerary and this is truly an all inclusive package. land settings and camping grounds. Swags and bedding provided. 8 Nights of camping is included in the tour. Mud Bath at Eulo is an optional extra and is $65 per person. We highly recommend this unique experience. REX Regional Express Airlines operates a twice-weekly flight Brisbane to Cunnamulla and return. Flight upgrades are available for an extra charge of $200 per person each way and must be requested at the time of booking tour.